From an early age, Antonio Segura Donat helped his father to take care of the more than five hundred birds they raised at their family’s Spanish country home. Growing up surrounded by them as well as the fish, dogs, and horses that lived on the property, it wasn’t shocking that his artistic inclinations led him to create wildlife illustrations of the exotic animals found in his parents’ encyclopedias, nature books, and fables collections. As a young adult, while studying economics at the Universitat de València, a close friend introduced Donat to street art, suggesting he use the tag Dulk to honor a fellow writer that had died in a traffic accident. Embracing this creative outlet, Donat spent the next year painting on street walls and drawing in his math textbooks, ultimately abandoning his economics education to enroll in the Escola d’Art i Superior de Disseny de València to focus on illustration and graphic design. With a post-university career that included creating works for animation, fashion, and advertising, his personal output as Dulk continued to grow and gain attention, eventually causing him to fully embrace the artistic alias; no longer signing works in any medium with his real name, all his creations were now attributed to Dulk. Inspired by the natural landscapes of the Flemish painters and the visual language of surrealism, Dulk developed his own personal style, becoming a sort of artistic biologist that conveyed grander purpose through fantastical elements. And this form of fabulism suffuses his works, each animal-themed tragicomic piece uncovering the curiosities and secretive ways of the organic forms he deconstructs. Manifesting through street murals, canvas paintings, graphite illustrations, and even sculptural forms, Dulk has established his own visual language, one that frequently includes heart- or circle-shaped chest holes as well as cleanly severed appendages floating in place as if still attached to the beast’s body. 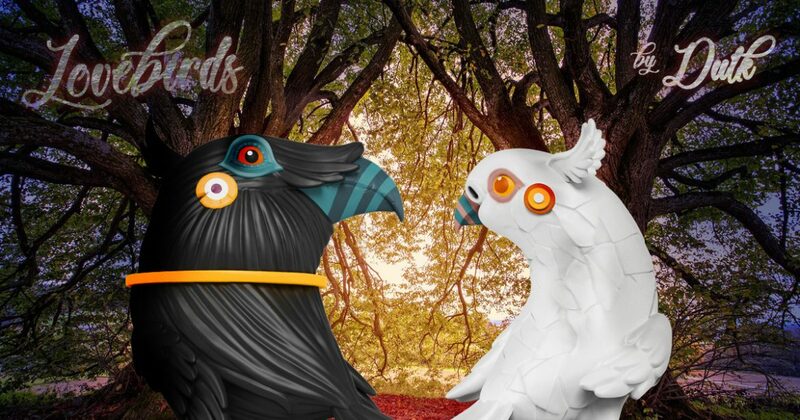 Regularly drawn to depicting birds, it’s no wonder that his first realized designer toy edition with Mighty Jaxx is a pair of the avian creatures, a duo known as the Lovebirds. Lovebirds are a diminutive type of parrots that are notably affectionate, monogamous pairings of them spending long periods sitting together. And it is due to this core in their nature that the term lovebirds informally indicates any openly affectionate couple. Dulk’s interpretation of the concept debuted in 2017 as a painting created for the album cover of Claude VonStroke‘s collaborative release with Will Clarke & Sébastien V, the Works Well With Others 12″ EP. Amidst a scene that includes a unicorn, Dulk’s focal creations herein are two birds that are seemingly in complete contrast to one another: a slender, white avian with wing-like tufts adorning its head, imparting a lighter than air feel to it, opposite a stocky, dark-colored beast who is decapitated by a figurative halo of cartoonish gore. Immediately reminiscent of the adage that “opposites attract”, even this pair’s heart-shaped holes exude their differences, the cavity of the darker one having been bricked over, cracks rending it apart as leafy plants that have emerged from the other bird’s spacious opening push their way through. Yet a close observation this painting allows one to also note their similarities, each of them having a texturing that suggests a stonelike hide. Representative of two opposing but complementary fundamental forces of natural life, these Lovebirds strike a balance and harmony with one another. Limited to an edition of 300 pieces, these hand-painted polystone resin sculptures produced by Mighty Jaxx come as a pair, each set packaged in a custom-made box with certificate of authenticity. With Dulk having modified his concept for this sculptural interpretation, the black-colored bird had shed its rocky texturing for a more fluid, hair-like form, one that furthers the differences evident in the pair. And lacking the greeny growth bridging the gap between them, the bricked over heart structure stands steady, a massive keyhole securely locking its secret longings away. And yet their stance still symbolizes the loving union of the two, the negative space between them forming a suggestive heart shape when they are beak-to-beak. Click Here to Purchase Dulk’s Lovebirds.